Warehouse safety and forklift safety go hand in hand. Since forklifts are commonly used in warehouses, many of the best safety practices that apply to powered industrial trucks are also valid in warehouses. CertifyMe.net has the training programs to help you become a better, safer forklift driver. And for employers, we can help all of your employees become OSHA compliant in no time at all! We’re the trainer of choice for companies across the United States, and we can improve your safety program today. We offer a wide range of courses for any skill level, along with 3-year renewal training. Our OSHA compliance and training experts know all about forklift safety in the warehouse, and this article will show you how to take those concepts and make any workplace safer! The ability to apply warehouse safety practices to other job sites is very helpful for workers who started out in warehouses. And let’s be honest. If you’re reading this, you’re probably a forklift driver (or want to become one). And your first forklift job was most likely in a warehouse. So what safety practices for warehouse forklifts can you apply elsewhere? Let’s take a look. Maintenance matters. For whatever reason, forklift maintenance is usually associated with indoor, warehouse based lifts. But keeping a regular maintenance schedule is also helpful for forklifts in other environments, especially construction sites. Rough terrain forklifts require thorough maintenance checks to ensure they’re operating at peak capacity. If they’re not, accidents and injuries can occur. Eliminating blind spots. In warehouses, blind spots are a primary cause of accidents. Blind spots can happen for a variety of reasons: dim lighting, poor visibility around corners, shelf positioning, and many others. For many non-warehouse settings – especially in outdoor job sites like construction sites – blind spots exist. Although, not the same way warehouse hazards do. Outdoor blind spots can be caused by other construction equipment, natural landscape features, sun, and more. Keep it clean. If you’ve ever operated a warehouse forklift, one thing you know about is the importance of clean, debris-free aisles. Well, the same thing applies anywhere forklifts are used. For docks and shipyards, debris can cause a lift to slip or tip over. On construction sites, uneven terrain is a serious safety hazard. If you notice any debris or obstacles, notify your co-workers or safety supervisor immediately no matter where you are. Ensure your training is up to date. 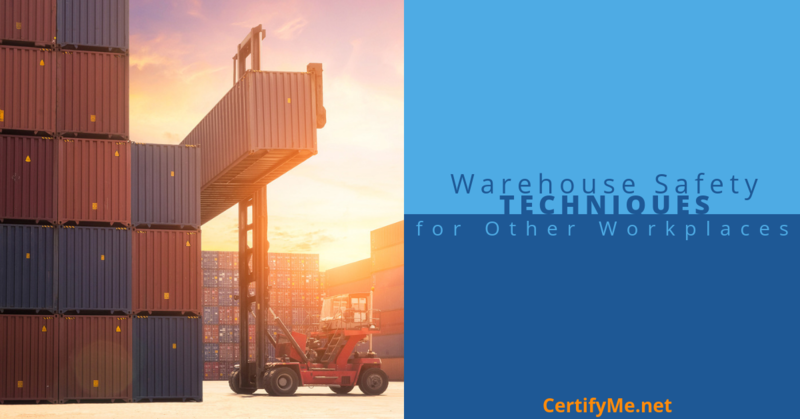 A warehouse isn’t the only place where your forklift training needs to be on point. For any job setting that uses powered industrial trucks, training is the most important part of any safety program. Just because you’re not in a warehouse doesn’t mean you can skip on safety. If your non-warehouse forklift job requires initial or renewal training, get started with CertifyMe.net today! Good safety practices are valid anywhere you work. While this blog explains ways you can use forklift safety on other job sites, remember this: safety is always your first priority, no matter where you operate a forklift. That’s why OSHA requires forklift and pallet jack training. Without OSHA compliant training, you’re not certified to run powered industrial trucks. There’s a good reason behind this. Accidents and injuries are bound to happen without proper certification and training. If you need to get OSHA compliance (for both employees and employers), CertifyMe.net is the best place to start. Click here to get started today. If you have any questions about the training requirements for warehouse forklifts, call us today at 1-888-699-4800.